Francis Bitonti Studio explores design using 3d printing as a tool. From algorithmically designed chairs and wall hangings, to designer clothing acessories. 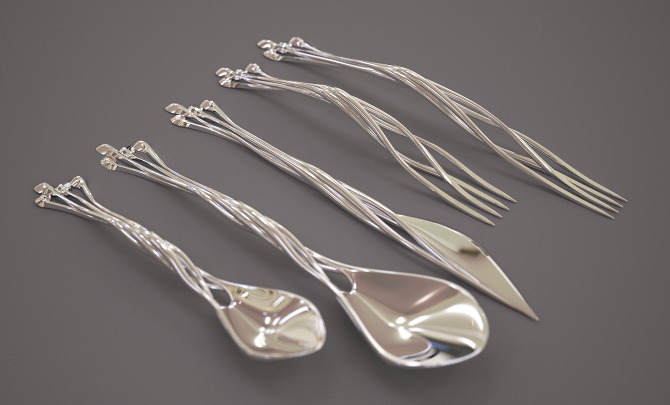 One of the latest pieces is a 3d printed flatware set. Bitonti uses 3d printed steel that is then silver plated to render it food safe. For production, this kind of finishing of 3d models allows designers to create even more intricate products. With some outside help, 3d prints can be chromed, nickle plated, or even silver plated. This flatware set show the kind of design 3d printing allows when the creativity of the designer is freed to make things not possible with standard molds. What Are 3d Printers Bad At?